Call Boat Owner Peter 401-286-6844. 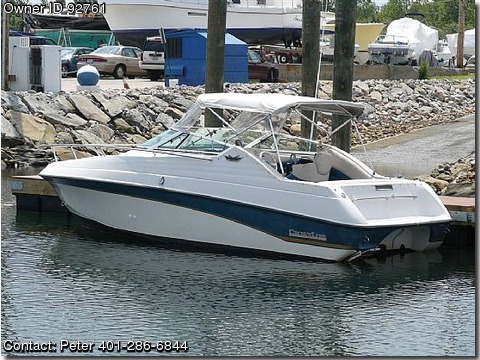 1995 CROWNLINE 210CCR, 21 ft, cuddy cabin, 5.0L Mercruiser with 237 hours. Swim platform with boarding ladder, walk-thru windshield, bow hatch, retractable bimini top with full 360 enclosure and mooring cover. Features two captains chairs, large rear seating area, fill-in V berth, galley with sink, ice chest and electric/alcohol stove, port-a-potty compartment (new potty included), table which mounts on deck or in cabin. Comes with VHF radio, GPS, fish (depth) finder, AM/FM/Cassette with plug for CD player and includes separate DVD player. Also includes trim tabs and two batteries (starting and house) with new on-board dual battery charger. Used every weekend for short trips and lovingly cared for by owner.the boat was re-powered in 2006.